Throughout August at BFI Southbank, BFI Future Film will explore immersive storytelling, from VR (Virtual Reality) to AR (Augmented Reality), 360 and more. Virtually Summer will offer unprecedented access to new immersive technology through a variety of practical workshops, masterclasses and screenings. Activities are designed to both inspire young filmmakers and give them the opportunity to try out immersive filmmaking kit. A number of events will be free, and ticketed events are just £6 for 16 – 25-year-olds. Activities kick off on Wednesday 8 August at 19:00, with BFI Future Film Virtually Summer Pop-Up Cinema and Launch party in BFI Southbank’s Atrium, free for all to attend. This immersive space will transport visitors to a ‘forest’ enabling them to explore the natural world using VR. The space has been designed and built by students from Wimbledon College of Arts’ Set Design for Screen course. Earlier in the day there will be an Introduction to 360 Filmmaking, in partnership with Virtual Umbrella, giving 16 – 25-year-olds a taster in creating 360 panorama films. Free sessions include a sneak peek of Bro Bots on Wednesday 15 August. Bro Bots is the first ever VR comedy series, hailed as a game-changer for the entertainment industry, and the latest series from top London VR studio Breaking Fourth. The screening will be followed by an exclusive panel discussion, Q&A and networking drinks. Also free to attend is an evening with the Digital Maker Collective who will showcase their incredible digital and immersive experiences. There are also nine free drop-in sessions at the pop-up cinema throughout the month. The main foyer of BFI Southbank will host a VR Igloo from 22 – 24 August, free to everyone to step inside and be immersed. Inside the Igloo will be a number of 360 film screenings offering a truly shared VR experience. Workshops include Storytelling for Immersive Film, an afternoon with industry professionals who will discuss key considerations for scriptwriters and storytellers working in immersive filmmaking, and Creating Immersive Worlds VR Workshop a hands-on workshop is delivered by the Digital Marker Collective offering participants the chance to create their own VR landscapes, objects and characters. Virtually Summer also offers another chance to catch Spielberg's READY PLAYER ONE (2018) in 3D at the cinema. The film creates incredible worlds of imagination and explores a possible future where VR is part of everyday life. The screening will be followed by a discussion on the future of VR in film and media. We’ll be officially opening the doors to our VR Pop-Up Cinema space to the public at 6pm on Wednesday 8th August. Come and join us for a FREE drink and check out the space designed and built by Wimbledon College of Arts Set Design for Screen Students. Immerse yourself in our sensory space that explores the natural world through technology and try out some specially curated VR experiences. If you missed Steven Spielberg's Ready Player One in the cinema then here's your chance to check it out as part of our Virtually Summer programme in 3D. When the creator of a virtual reality world called the OASIS dies, he releases a video in which he challenges all OASIS users to find his Easter Egg, which will give the finder his fortune. This roller-coaster adventure movie features an all-star cast and creates incredible worlds of imagination, exploring a possible future where VR is part of everyday life. See how many 80's film references you can spot in the movie! Following the film, we'll host a discussion on the future of VR in film and media. Top London virtual reality studio Breaking Fourth has teamed up with BFI Future Film to showcase their new VR series, Bro Bots - the world’s first virtual reality comedy series. Bro Bots takes place in a futuristic New York City and follows two British police robots and unlikely best friends, Otis and Roberto, as they solve crimes for the NYPD. The screening, taking place on Wednesday 15th August, will be the first time Bro Bots has ever been shown to a live UK audience, following its successful release during Tribeca Film Festival in April. 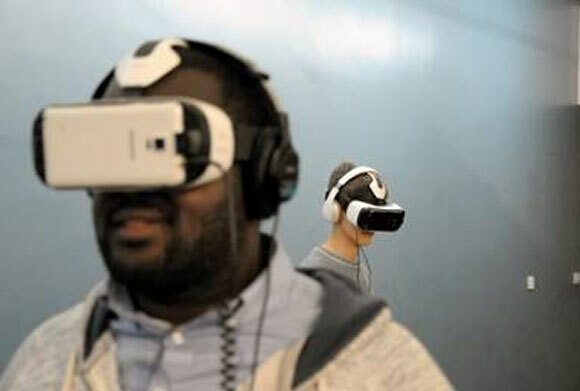 Commissioned by Samsung VR, it is being hailed as a game changer for the entertainment industry. Visitors attending the one-off event will be able to watch two episodes of Bro Bots in a first-of-its-kind screening. Alongside the screenings, viewers will also be treated to an exclusive panel discussion Q+A session, and networking drinks. Want to find out more about how to write for VR and other immersive storytelling formats? Join us for an afternoon of industry insights and creative inspiration where we’ll be joined by industry professionals who will discuss key considerations for scriptwriters and storytellers working in immersive filmmaking. Want to learn how to create VR worlds and characters? Join us for this practical hands-on workshop delivered by the Digital Maker Collective and try out software to help you create your own VR landscapes, objects and characters. Check out the incredible digital and immersive experiences that have been designed and developed by the Digital Maker Collective. Get your hands on tech, find out about how some of today’s brightest digital creators produce their work and network your haptic gloves off with a complimentary drink or two! Path to Paradise is a fully immersive VR installation created over a period of six months by the Mill+ Creative Technology team, made up of developers, artists and engineers. They have crafted four vast worlds, using virtual portals to effortlessly transition users between these distinct utopian landscapes. The immersive VR installation simulates a journey through a jungle to a beach, creating the feeling of being completely immersed in nature. The project is a response to the statistic that the average person spends 95% of their life indoors. “Crushed by the pressures of being 24 in the 21st century, a young woman dreams of a perfect version of herself in the perfect world.” Mundania follows the tale of a young woman who, with her perception skewn by social media, falls victim to her fantasy of an alternate perfect reality. Slowly her illusion engulfs her, until one day she vanishes without a trace. Mundania [concept film and virtual reality experience] is a modern sci-fi tale exploring sexuality, creativity and competitiveness in the age of social media, and the need to build an authentic identity for ourselves online.